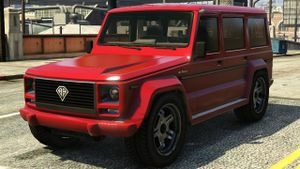 A Dubsta in Grand Theft Auto V.
The Benefactor Dubsta is an SUV in Grand Theft Auto V. It is based on the Mercedes-Benz G-Class. Dubsta 6x6, a six wheeled off road pickup truck variant of the Dubsta. This page was last modified on 18 June 2014, at 19:38.